New York State Public Service Commissioner Diane Burman today voted against motions to give Charter Communications more time to develop its six month exit plan to leave New York and a motion to get more time to file a rehearing request about Charter’s alleged violations of merger conditions governing its behavior in the state. 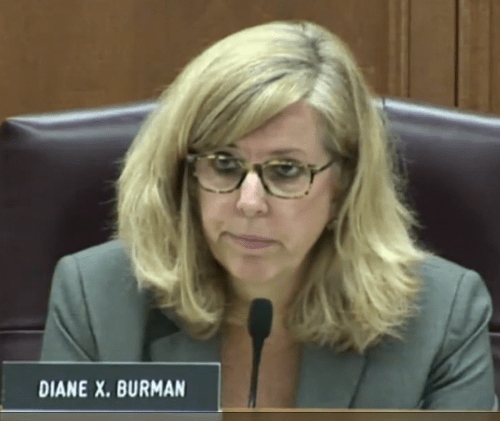 Burman’s opposition was rooted in her irritation over PSC Chairman John Rhodes’ decision to hold an unscheduled special session of the Commission on July 27 (which Burman did not attend because of a scheduled family vacation) where the three remaining commissioners all voted to cancel approval of the Merger Order allowing Charter Communications to acquire Time Warner Cable in New York State. Burman argued the Commission’s recent approval of time extensions in the Charter case could set a precedent that could take the regulatory agency down a road where companies like Charter and other utilities could delay proceedings by having informal private talks with Commission staff. As a result, Charter has effectively stopped the Commission’s clock on pre-determined deadlines like a 30-day limit to file a petition asking the Commission for a rehearing. Because the Commission has approved delays allowing Charter company officials and the Commission to continue privately discussing matters, none of those conversations are on the public record and no groups, including Stop the Cap!, can scrutinize the discussions and file comments about those conversations, Commission decisions that may result from those talks, or suggest alternative corrective measures to consider. The PSC’s counsel this morning admitted the Commission and Charter were engaged in active settlement discussions, but it isn’t known if those talks relate to overturning the Commission’s decision to banish Charter from the state or are about more procedural matters such as how Charter plans to hand over cable service to another entity. “I think there are lessons to be learned from having the special session without me there and I do think that going forward, we need to be more cognizant of taking into consideration what the perception is by not having the full Commission body, minus one because there is a vacancy, [vote together on matters of great consequence like this] regardless of whether counsel believes there is an appropriate quorum or not,” Burman added. The final vote on both measures extending deadlines in Charter’s favor was 3-1. Both measures passed.